(Nanowerk News) Besides the 92 elements that occur naturally, scientists were able to create 20 additional chemical elements, six of which were discovered at the GSI Helmholtz Centre for Heavy Ion Research in Darmstadt. These new elements were produced artificially with particle accelerators and are all very short-lived: they decay in a matter of a split second. However, scientists predict the existence of even heavier elements with an extreme longevity, leaving them to only decay after years. These elements form an island of stability. Scientists at the GSI Helmholtz Centre for Heavy Ion Research in Darmstadt have developed and applied a measuring apparatus that might allow them to discover such long-lived elements, reports the renowned scientific journal Nature ("Direct mass measurements above uranium bridge the gap to the island of stability"). 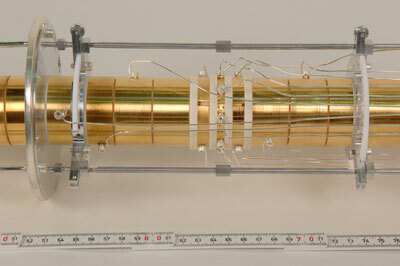 The picture shows the Penning trap, which is part of the Shiptrap experiment. A magnetic field parallel to the tube forces the arriving ions onto a spiral course inside the tube. The ions’ spiraling frequency is used to directly calculate their atomic mass. An international team of scientists headed by Michael Block was able to trap atoms of the element 102, nobelium, in an ion trap. This is the first time in history that a so-called super heavy element had been trapped. Trapping the element allowed the research team to measure the atomic mass of Nobelium with unprecedented accuracy. The atomic mass is one of the most essential characteristics of an atom. It is used to calculate the atom’s binding energy, which is what keeps the atom together. The atom’s binding energy determines the stability of an atom. With the help of the new measuring apparatus, scientists will be able to identify long-lived elements on the so called islands of stability that can no longer be assigned by their radioactive decay . The island of stability is predicted to be located in the vicinity of the elements 114 to 120. „Precisely measuring the mass of nobelium with our Shiptrap device was a successful first step. Now, our goal is to improve the measuring apparatus so that we can extend our method to heavier and heavier elements and, one day, may reach the island of stability”, says Michael Block, head of the research team at the GSI Helmholtz Centre. The experiment was a collaboration between GSI, the Max-Planck-Institut für Kernphysik Heidelberg, the Universities Gießen, Greifswald, Heidelberg, Mainz, Munich, Padua (Italy), Jyväskylä (Finland) and Granada (Spain) as well as the PNPI (Petersburg Nuclear Physics Institute) and the JINR (Joint Institute for Nuclear Research) in Russia.